Bobcat Goldthwait’s Willow Creek West Coast premiere with musical guest Tom Yamarone on Friday, May 31, at Arcata Theatre Lounge, 1036 G St in Arcata. Doors open at 7 p.m., movie screens at 8 p.m. followed by a question and answer session with Bobcat Goldthwait and a musical performance by Bigfoot songwriter Tom Yamarone. Cost is $7 with advanced tickets available at the Arcata Theatre Lounge and is for mature audiences only. Jim and his girlfriend Kelly are in Willow Creek, California, to retrace the steps of Bigfoot researchers Patterson and Gimlin, who, in 1967, recorded the most famous film of the legendary monster. Kelly is a skeptic, along for the ride to spend time with her boyfriend between acting gigs. Jim, a believer, hopes to capture footage of his own, so his camera is constantly rolling. The small town is a mecca to the Bigfoot community; sasquatch statues guard the local businesses, murals of the missing link line the roads, and Bigfoot burgers are the town delicacy. The couple interview locals who range from skeptic to believer and from manic to completely menacing. Some of the stories they hear are of chance encounters with a gentle creature, while others are tales of mysterious eviscerations. On the day that Jim and Kelly plan on hiking into the woods to look for proof, they are given a simple warning: “It’s not a joke. You shouldn’t go there.” Despite the ominous message and Kelly’s own reservations, they head deep into the forest to set up camp. The events that follow will make them wish they had simply spent the night at the Bigfoot Motel. 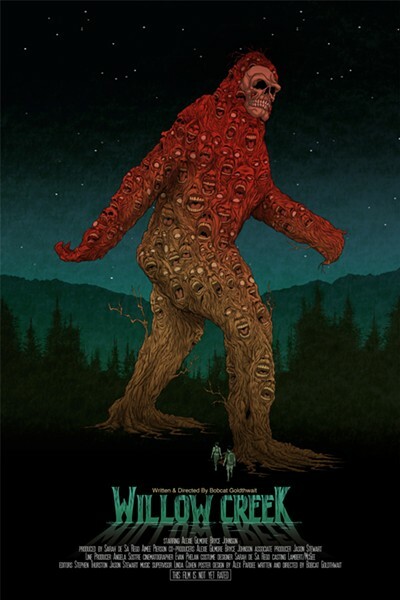 Director Bobcat Goldthwait (WORLD’S GREATEST DAD, 2009; GOD BLESS AMERICA, 2012) pumps new life into the found-footage horror genre with WILLOW CREEK. His characters’ genuine humor gives them a humanity that is essential to setting up the scares. The satire is so successful that the film’s audience will have no idea what to do with the tension and fear that comes later—other than to white-knuckle it while sitting in the dark. Tom Yamarone is a singer/songwriter from Pleasanton, California. His active participation in the search for bigfoot started when he attended the International Bigfoot Symposium in Willow Creek in 2003 and even got to perform a song there. Since then, he has been out searching the woods of Northern California, the Sierra Nevada mountains and networking with other bigfoot researchers. Tom performed his songs at the 2005 Sasquatch Research Conference in Bellingham Washington, the 2006 Bigfoot Rendezvous in Pocatello, Idaho and at Bigfoot Discovery Day last June in Santa Cruz, CA. He joined the BFRO (Bigfoot Field Researchers Org.) in May 2004 as an investigator and is a sponsor and volunteer at the Bigfoot Discovery Museum in Felton, California. He also sits on the board of directors of the Alliance of Independent Bigfoot Researchers (AIBR), a non-profit research organization. He enjoys writing songs about the bigfoot phenomenon and can be heard playing these at summer campfires throughout Northern California.